The main design requirements for this room is that the client didn’t want the decor changed, but did want fully thrilling 7.1 HD surround sound capability for her Samsung 55″ LED that sat on an entertainment shelf in the corner. Seating capacity was important, as she often hosts movie nights with all of her friends. Another limitation was that the client had been to a friend’s home that had theater-in-a-box surround and did not want the clutter of speakers sitting around on endtables with wires showing everywhere. So our design team went to the drawing board to come up with some options to present for approval. The entertainment center was out, as there wasn’t room for the needed components there, it was decided that a wallmount of the HDTV with concealed wiring would improve viewing angles for guests and gain floor space. The only available mounting wall was too narrow to use the traditional single left, center and right wall mount front speakers to frame the display. And there was no space available to use tower speakers in the front either. A great sounding KEF L/C/R soundbar proved to be the perfect choice for fronts, with Pinnacle K6 kevlar ceiling speakers for L/R surrounds. A substantial pair of Monitor Audio BR 8’s was placed face-up behind the couch in the alcove for rear surround channels. 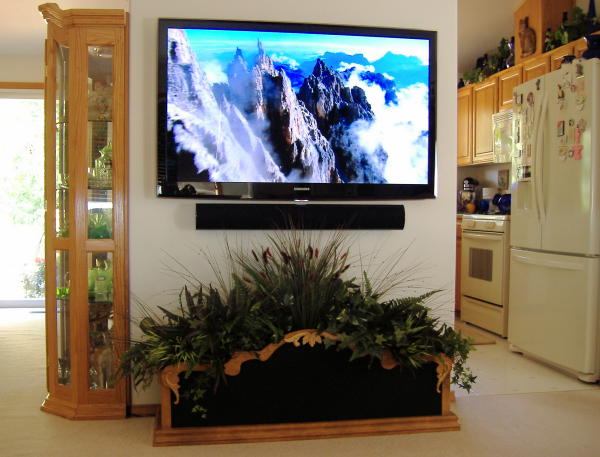 A truly unique touch is the 600 watts of dual driver subwoofer power concealed behind the grillecloth of the decorative planter box that the artist client designed and built right below the HDTV display! The end result is a thrilling and powerful 7.1 theater experience that is barely detectable visually, the only impact on room decor is enhancing. And with careful planning we actually increased the client’s floor space while adding all of this functionality. 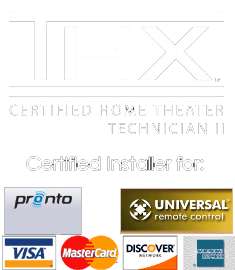 The AV gear rack is automated and controlled from the theater with a URC MX-450 RF remote. We installed the Onkyo HDMI 1.4 AV receiver, Panasonic BluRay and Direct TV box in a closet down the hall out of sight. An added benefit there was to redo the closet shelving with a Rubbermaid storage system, which allows the same storage capacity as before after we added all the componentry.